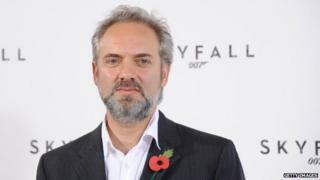 James Bond director Sam Mendes has said he does not want to make any more 007 films after the next instalment, which comes out in October. "I said no to the last one and then ended up doing it, and was pilloried by all my friends," he said. "But I do think this is probably it." Mendes directed 2012's Skyfall and the forthcoming Bond film, titled Spectre. "I don't think I could go down that road again," he said. "You do have to put everything else on hold." Spectre, in which Daniel Craig will make his fourth appearance as the MI6 agent, will come out on 26 October in the UK and 6 November in the US. Image caption The Spectre plot involves "a cryptic message from Bond's past"
Spectre and Skyfall took a total of five years to make, he told BBC Radio's Test Match Special. "It feels almost, even though we've just finished shooting it, like one big experience and it was a fantastic life-changing thing," he said. But he added he did not think he could go through it again. "It really is more a lifestyle choice than a job," he said. Mendes made his name in theatre, and directed a new stage production of Roald Dahl's Charlie and the Chocolate Factory in between making the Bond films. But shooting a Bond movie is "pretty much all encompassing", he explained. "I'm happiest rehearsing a play or editing a movie, and when I've finished editing a movie I generally want to be back in a theatre environment again," he said. "It feels like home, it feels controllable after the chaos of a movie set. But it won't be long before I want to do another film, and I'm very fortunate to be able to go back and forth between the two." Spectre has been filmed in locations including London, Mexico, Italy and Morocco, and the cast and crew totalled more than 1,000 people, Mendes revealed. "And you really do feel it," he said. "This is a bigger movie than Skyfall. It's shot in more places - we were in Mexico City and Tangiers and northern Sahara and Rome and the Alps and London. It's been an enormous undertaking." Spectre also stars Christoph Waltz, Lea Seydoux, Andrew Scott, Naomie Harris, Ben Whishaw, Dave Bautista, Monica Bellucci and Ralph Fiennes. The plot involves "a cryptic message from Bond's past [that] sends him on a trail to uncover a sinister organisation". Mendes revealed that the Spectre theme song was finished - but would not disclose who had recorded it. "I can say that the song's been recorded and it's fantastic and I'm very excited about it," he said. "You won't have to wait long." Skyfall made £700m ($1.1bn) at box offices worldwide.